Fauquier Health holds a collection of unwanted medication and sharps about twice a year. We've been doing it long enough now that residents save up their unused medications so that they can dispose of them safely -- and keep them out of the landfill and/or the water supply. People are very gracious when they drop off their medications. They really seem to appreciate a way to dispose of their medications. Most of the visitors are from nearby, but we had some from Culpeper this past Saturday, April 25. The effort requires a half dozen or so volunteers to collect the items as visitors drive-through. 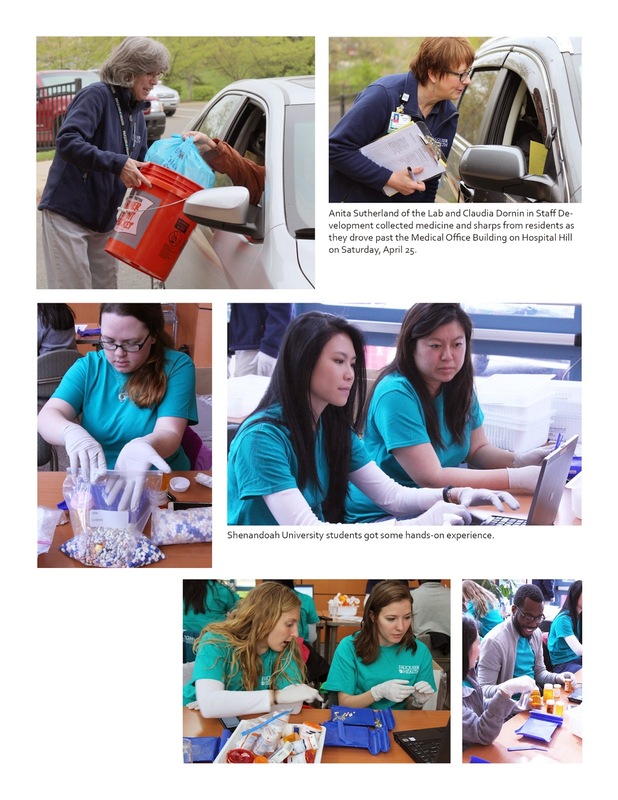 Students of the Shenandoah School of Pharmacy collect, count and catalog the medications, with oversight from experts from the Fauquier Health Pharmacy. Two officers from the Warrenton Town Police were there too, since prescription medicines are a target for theft. Here's a behind-the-scenes look at what it takes to collect these medications.